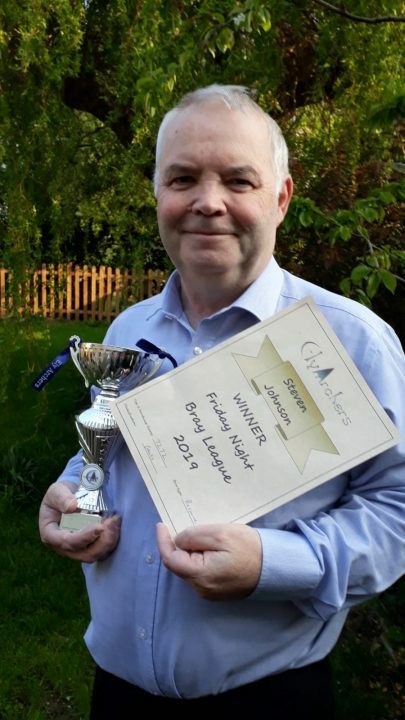 Steven Johnson is the first winner of the 2018/19 Friday Night Bray League at Ely Archers. The Bray league is shot on a Friday night indoors only, and consists of shooting 30 arrows at a 40cm target face. The round is handicap based and each entrant must submit at least 5 scores, with the top 5 scores being used. Steve shot a total of 6 rounds and finished the season with a top 5 adjusted handicap score of 7,575. All of his top 5 scores he submitted were above his current handicap for that week. Steve is pictured with the new Bray trophy and winners certificate. A full list of results are available on the Friday Night Bray League results page.